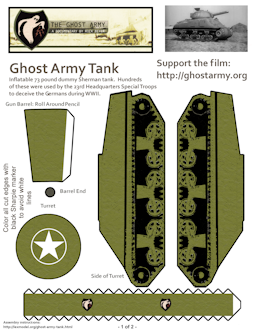 Go to Rick Beyer's Ghost Army website to find out about the Ghost Army and the inflatable tanks used to deceive the Germans. The 3D SketchUp model from which this cut and assemble model was created. First, make sure that you have read the General Instructions for Building My Models page. 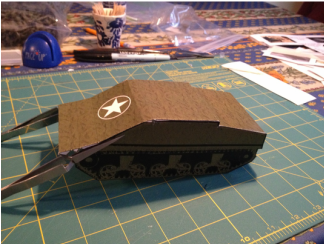 This is important since I will assume you are following all of the instructions on that page of general instructions that apply to all of my paper models. The first thing to do is to cut out all of the parts, being careful to put them in a plastic bag so that you don't loose any small pieces. Next with a dull knife (the kind you use at the dinner table) score all of the tabs so that it will be easy to make folds in the paper. (Figure 1) The bottom of the tank has black dotted lines. Unfortunately similar lines are not on the top, but you should score lines between the points where the tabs come closest to the printed inner part of the part as seen in Figure 1. 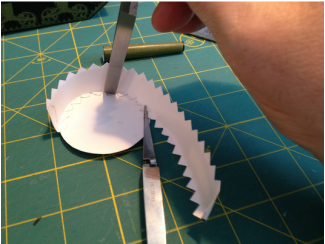 The knife is dull enough so that you will not cut the paper, just leave an inditation so that folds will be crisp. 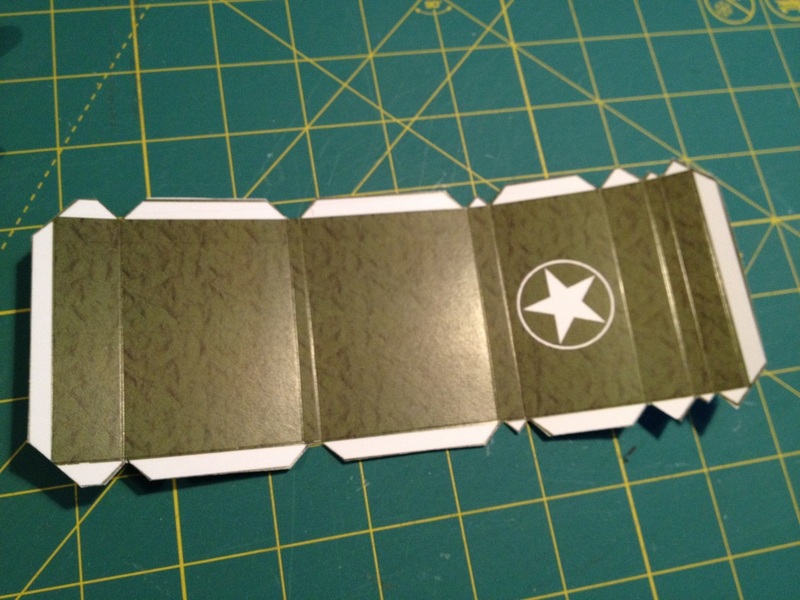 Fold the tabs as in Figure 2. Glue the side of the tank to the middle of the top deck of the tank. 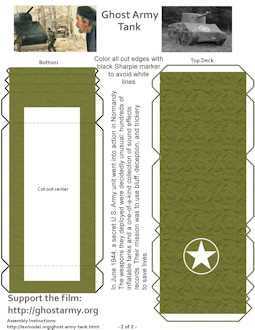 Note that the front of the deck has the star on it and the front of the side slopes down more than the back. The sides are different, so make sure you that get the correct side of the tank matched with the correct side of the top deck. 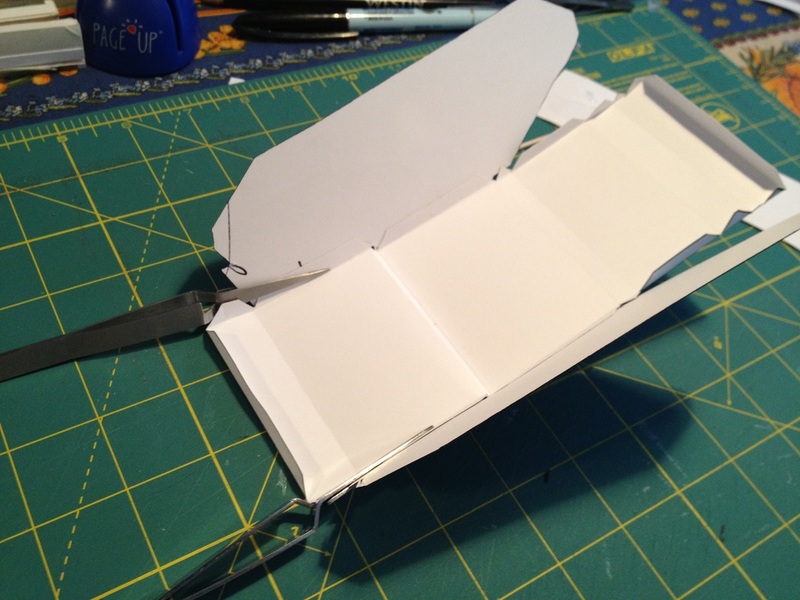 Unfold the tab so that it is flat, apply glue to the tab and then position the side so that the highest part of the side is over the tab. 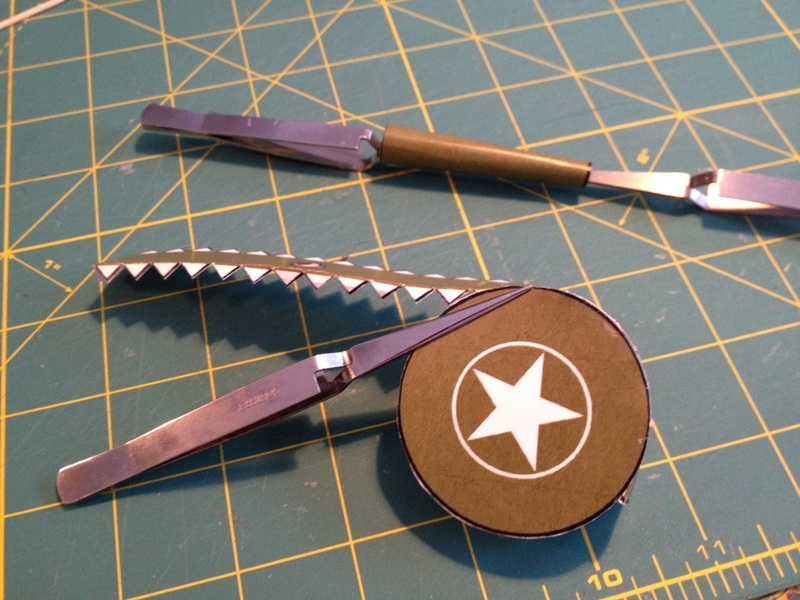 Either hold the parts together or use clamps until the glue is set -- usually about 30 seconds. Although it won't be entirely dry, you can take the pressure off and give it another 30 seconds and it will hold. Do the same for the other side as in Figure 4. Now start gluing the tabs on the deck to the sides of the tank, first going towards the back of the tank on both sides, and then going forward to the front of the tank. Take your time and if you use clamps, let the clamps rest on your mat, possibly holding the rest of the model up in the air, as in Figure 6. Here in Figure 7 you see at the back of the top deck about two thirds of the way towards the back a place where the one fold is in and the other fold is out. 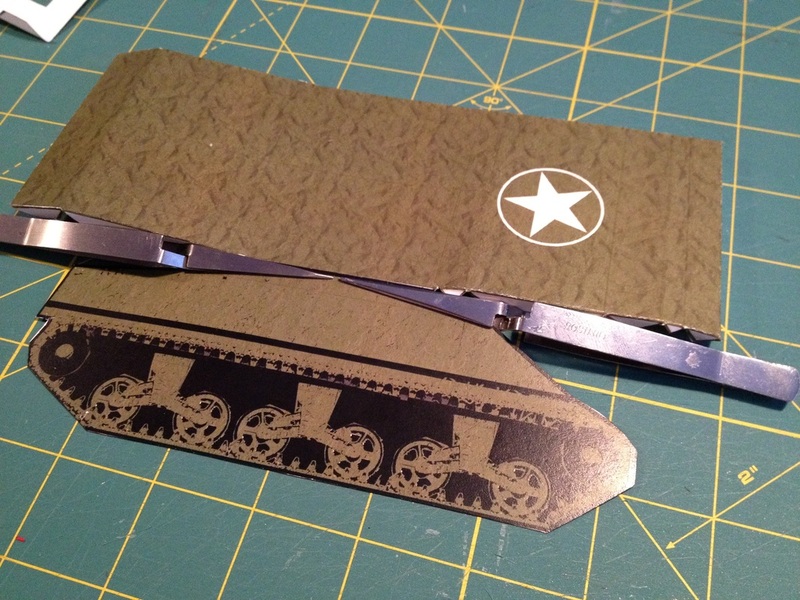 You should finish gluing all of the tabs of the top deck to the sides of the tank. 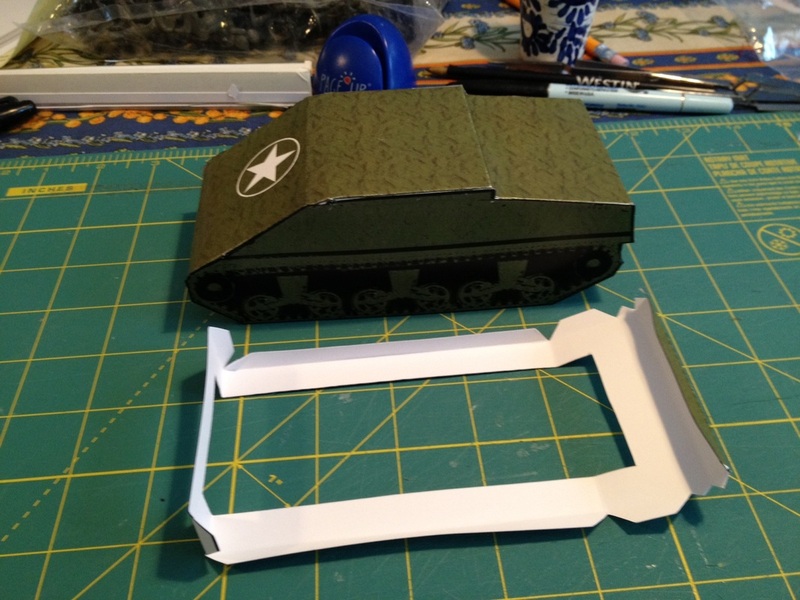 Next you attach the bottom of the tank to the assembled sides and top deck. 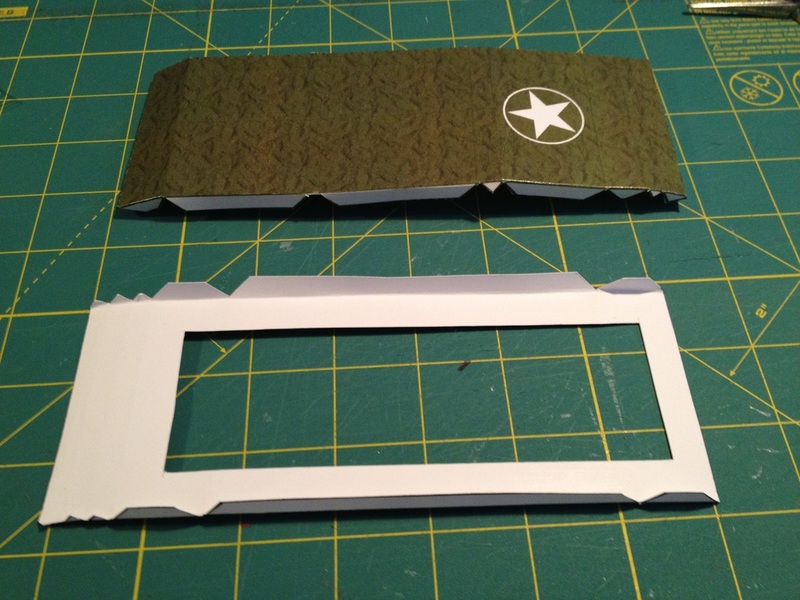 Next, work your way from the front to the back, gluing one set of tabs of the bottom onto either side. 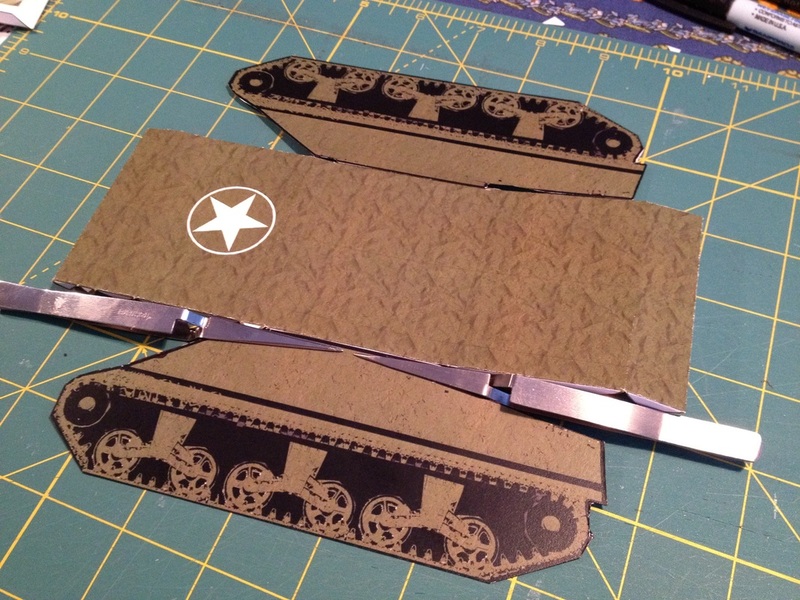 Do this one pair of tabs at a time until you have the entire body of the tank assembled. Roll the barrel of the gun around a pencil to form the round tube of the barrel. 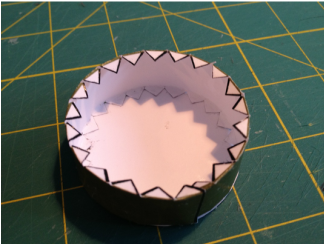 Then add glue to the tab and position the tab with glue along the edge of the barrel to form a cylinder where the diameter of one end is larger than the other. (Figure 10 and the top item in Figure 11). 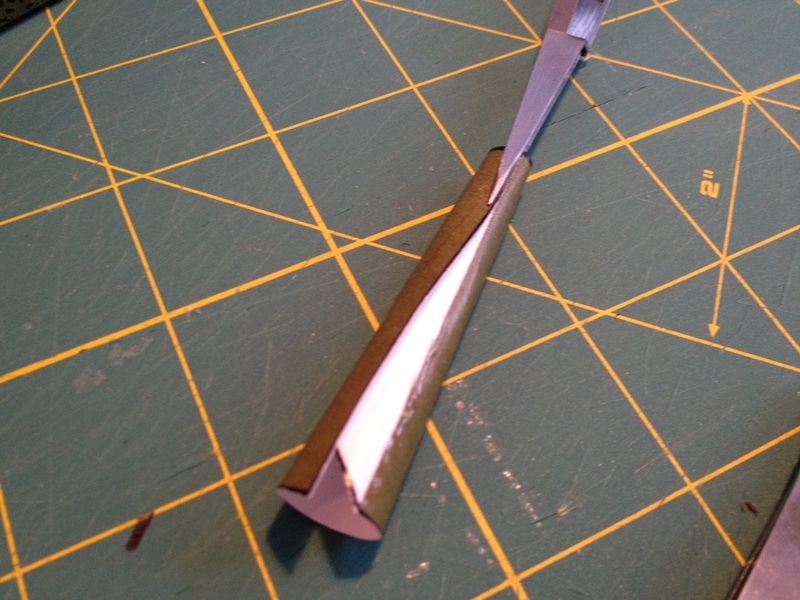 Apply glue to the black end of the gun barrel and attach it to the smaller end of the gun. Now comes the hardest part of the model: assembling the side of the gun turret to the top of the turret. The reason this is hard is that you need to both bend and glue the side of the turret at the same time. The key to doing this successfully is patience. 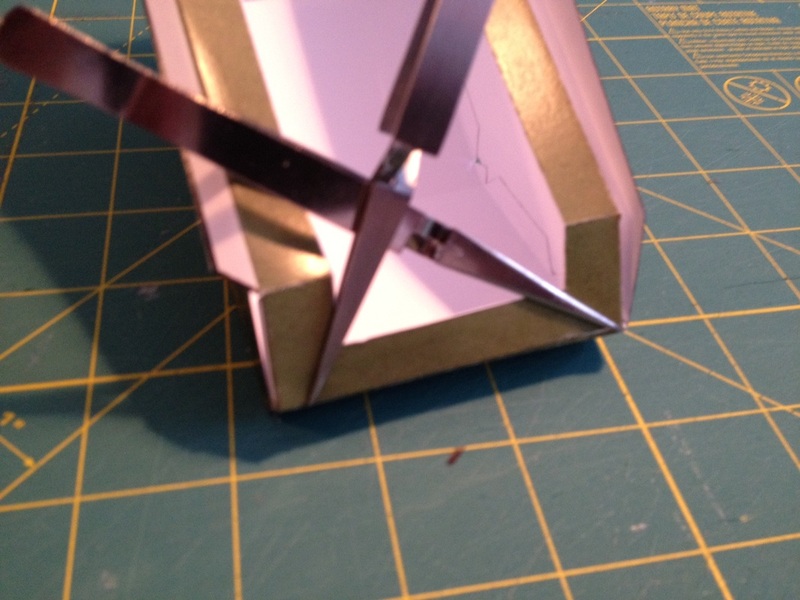 Start by gluing the end without the tab to the top of the turret. 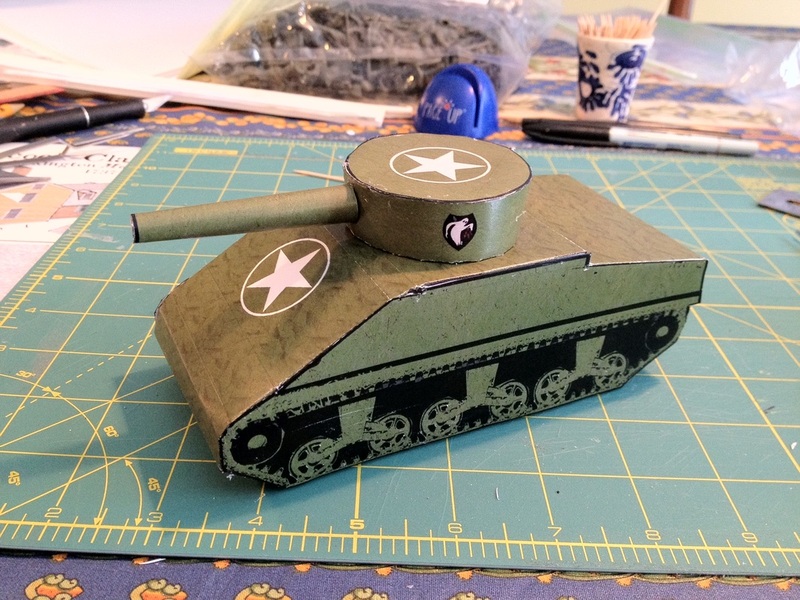 (Figure 11) Make sure you have the Ghost Army symbol facing up towards the star on the top of the turret. 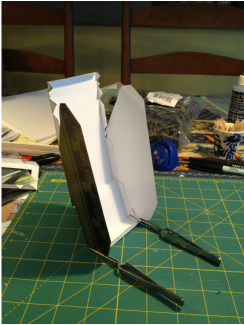 As each tab dries, put glue on a couple of more tabs and curve the side around so that it tracks the edge of the top of the turret, as in Figure 12. Continue until all of the tabs, including the tab at the end of the side has been glued. When you are finished, the gun turret should look like Figure 13. You can now put glue on all of the tabs on the bottom edge of the gun turret side and attach the assembled gun turret on the top deck of the tank, being careful to center it on the top deck gun turret area. Also make sure that the two Ghost Army icons on the side of the turret are symmetrical on either side of the tank. Now apply glue to the open end of the gun barrel. 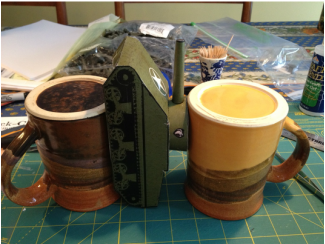 Set the tank assembly in an upright position (Figure 14) -- two coffee mugs work well as supports. Carefully position the gun barrel on the gun turret so that the barrel is pointing forward and is level with the top of the gun turret. Hold the gun barrel while the glue sets. Now, let your model dry for at least an hour so that all of the joints harden. 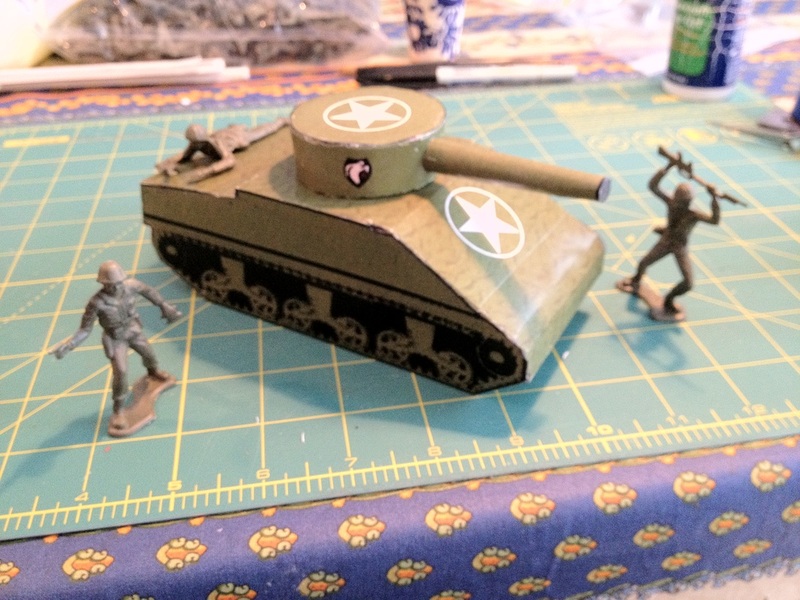 When you are finished, you tank should look like Figures 15 and 16. Congratulations, you have build a Ghost Army Tank! Figure 1: Scoring all of the tabs and places where folds need to be made.